Did you catch us as guest experts on Millionaire Matchmaker? We’re here to give you more advice on PattiKnows because it’s really never too late to find love. We are all told that if we want a great career, we have to set goals and work at it. If we want to be healthy and fit, we have to eat consciously and be purposeful about it. Yet regarding the most important aspect of it all — love — we are constantly sold a ridiculous myth that it will all fall into place, accidentally and magically. Love, like anything we desire in our lives, requires intentional action. We can’t expect it to happen by reading more articles on the internet. We can’t expect it to happen by sitting at home and visualizing our ideal mate and then turning on the TV and veg-ing out for the night. We simply can’t expect it to happen when we least expect it. One of the biggest blocks to finding love, as you get older, is all of the experiences you’ve had that have been, well, rather disappointing. Your heart has been broken, perhaps you’ve been cheated on (or you’ve been the cheater) or you feel that you just have too much baggage to make a relationship really work. We have successfully assisted numerous singles in our relationship coaching practice, and we’re asked constantly — is it too late for me to find love? This question is asked from people in their 30’s all the way up to their 60’s — all of them believing that because they haven’t found lasting love yet, that it may not be in the cards for them. This is the one myth we’d love to bust for all of you! The truth is that we have all learned to receive love in our family of origin — we call this your Love Imprint. Maybe your father only gave you affection when you achieved something, and now you feel like you have to prove your worthiness for love. Maybe your mother was sick and you had to take care of her, and now you are resentful that you give too much. Maybe your parents told you that your feelings didn’t matter, and now you struggle with expressing yourself and asking for what you need. Your Love Imprint affects your behavior on the subconscious level; however, it doesn’t mean that we are doomed to repeat the same pattern over and over. One of the benefits of being older is that we can more readily recognize the pattern that our Love Imprint has created. Take an inventory of your past relationships. How long did they last? Who initiated the break-ups? Rate your attraction/attachment on a scale of 1-10. Look for any patterns that you see repeated. Clear out any attachments to anyone from the past. Release them. Forgive them, heal your heart and move on. See yourself with your soul mate. What does it feel like to be together? Imagine and believe that you already have what you desire. 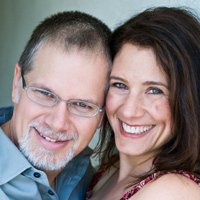 We started dating and got married after 40, and many people have told us that we were “lucky.” The truth is, we both made plenty of mistakes in relationship. In fact, we often joke that we became relationship experts because between the two of us we had made most of the mistakes one can make in love. The truth is we both did the inner work required of us to be open to receive love, and we are confident that you can too! There is an old saying that goes, “If you want something you’ve never had, you’ve got to do something you’ve never done.” If you continue the same dating patterns, looking for love in the same places, how can you expect to have a different outcome? Take a class in something new, join a different online dating site or work with a coach or matchmaker. In order to do things differently when it comes to love, you have to let go of the old way that is not serving you. Rather than feeling powerless to create love, access the part of you that knows you create your own reality, and stand in your power to bring in your Beloved.